This is an appetizer that I used to make all the time and then for some reason stopped making and am now starting to make again! It’s funny how that happens. It couldn’t be easier and it looks so good. 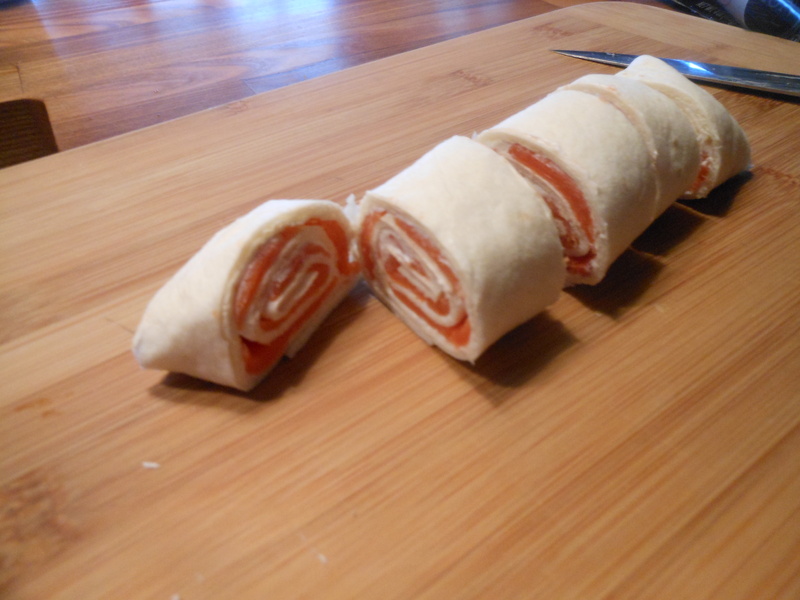 It’s good if you’re looking for something new to make, very few ingredients and all you’ll really need is a good sharp knife for cutting rolls. Out here in Colorado I was able to get very soft extra large tortillas, they work really well. 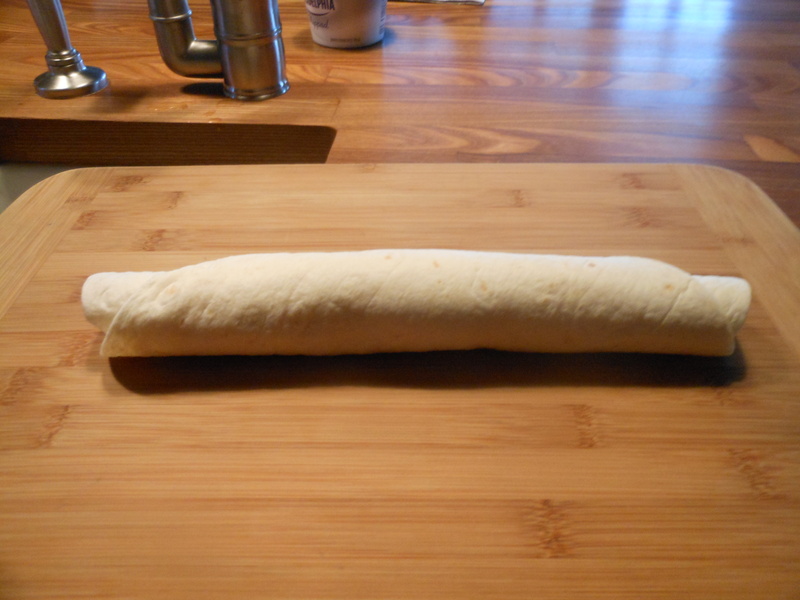 If you can’t find very soft ones, just use regular tortillas or wraps. If you can’t get large just use small ones. 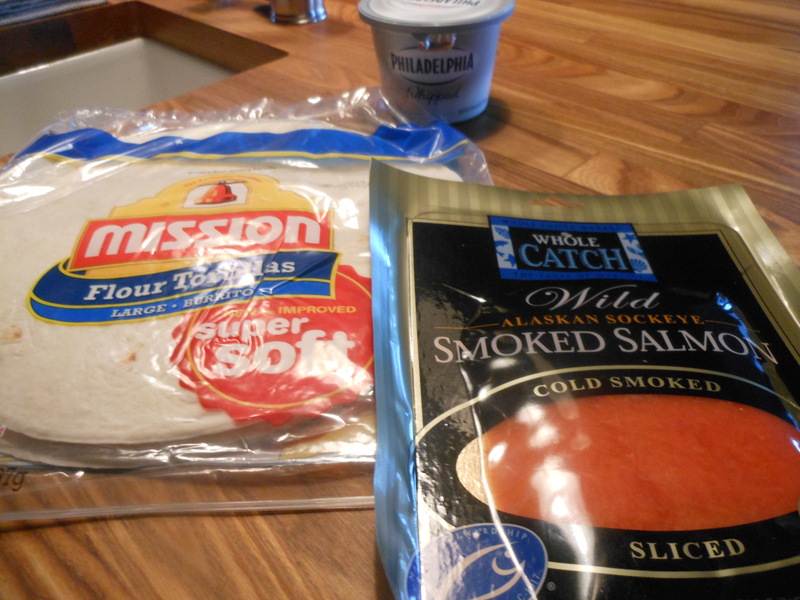 Look at photos, just lay salmon on top of cream cheese in a row starting at the top and go to just before the bottom of tortilla. One 4 oz. package will probably go for 3 large tortillas and 4 small. Good for 4 – 6 people. 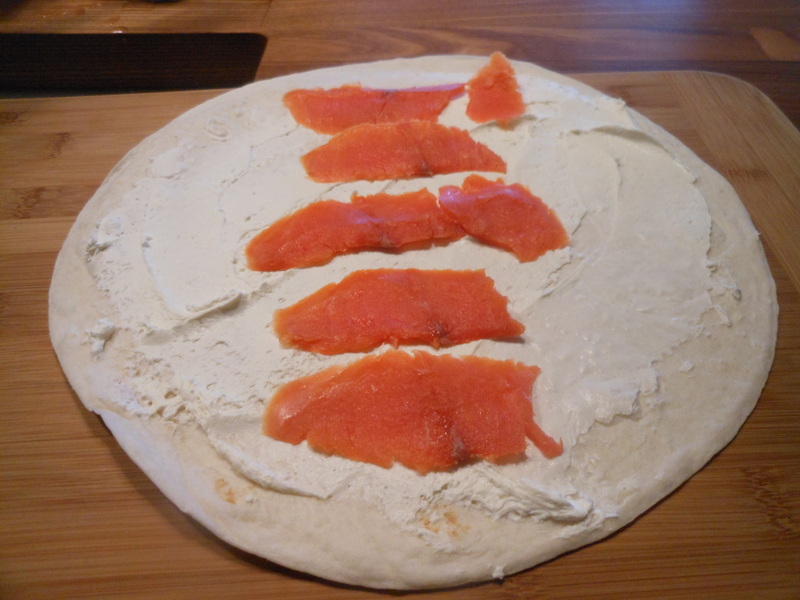 Take out tortilla , spread whipped cream cheese all over the tortilla, place slices of salmon starting at the top and go to almost bottom, and then roll up tortilla ( like a wrap) I cut off the ends, and then slice tortilla into app. 1 to 1 1/2″ pieces. App . 5 pieces per tortilla. Refrigerate till ready to eat and you’re good to go. Put on a pretty plate with some lemon wedges and you’re good to go. *you can add diced up red onions, or capers. Your call. I just did cream cheese and lox and they were perfect. This entry was posted in appetizers and tagged Cream Cheese and Lox Appetizer, Cream Cheese and Lox Rolls. Bookmark the permalink. Re-blog Monday and what’s more perfect than this perfect little appetizer? Having people over and looking for something to make as an appetizer that doesn’t take a lot of time or ingredients? Everyone will be impressed with your skills, and everyone (at least those who like salmon) will devour this. Enjoy this super simple recipe and Happy New Year!